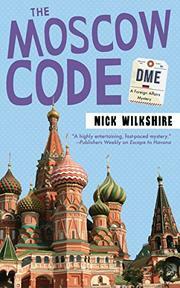 A novice diplomat needs all his guile and intuition to battle deadly Russian duplicity. Fresh from his shaky first assignment in Cuba (Escape to Havana, 2016), rookie Canadian diplomat Charlie Hillier is sent to Moscow, where, on his first night, Mercer, a dissolute acquaintance from decades ago, buttonholes him. Before Charlie knows it, he’s accosted by Elena and Svetlana, a pair of grifting prostitutes. Charlie and Mercer land in jail, where Charlie meets Steve Liepa, a levelheaded Canadian who claims he’s been incarcerated on a trumped-up drug charge. Charlie uses his status as a diplomat to free himself, but his adventure doesn’t endear him to Canadian ambassador Brigitte Martineau, though he survives his initial meeting with her after getting only a warning. Nothing daunted, Charlie sets out on a crash course in Russian culture with bureaucrat Oleg Sukov, who introduces him to comely lawyer Ekaterina Dontseva, whose help Charlie enlists in his attempt to get Liepa released. When Charlie flies home to Toronto for a conference, he fulfills a promise to Liepa to speak to his sister, Sophie Durant,who presses the hapless Charlie to commit himself further to helping Liepa. It’s already too late, though: Charlie arrives back in Moscow to the news that Liepa is dead. Duty compels him to investigate, a task made more difficult by the arrival of the distraught Sophie. Her pesky determination may be bad for Charlie, but it’s great for the story. Wilkshire’s second Foreign Affairs Mystery has a buoyant tone, an engaging hero, and an abundance of colorful characters.